Don't You Want Me has been adopted by s upporters of Aberdeen Football Club who change the chorus to "Peter Pawlett, Baby" at matches. They have been downloading the song in their thousands in tribute to the club's midfielder. A social media campaign to get the single to the top of the charts swelled following Aberdeen's Scottish League Cup victory on Sunday. A cup parade is planned in the city this weekend. Don't You Want Me is currently sitting at number seven in the iTunes chart and is expected to lodge in the official UK singles chart this weekend. 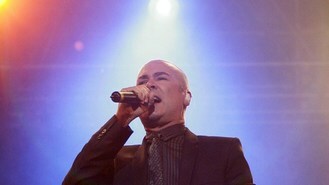 The Human League said on their Facebook page: " We are slightly stunned but at the same time very honoured that the fans of Aberdeen FC have chosen our song as their anthem to Peter Pawlett and their achievement in getting it so high in the charts in the space of just one day is a real testament to both their dedication to their club and to this player in particular. "Speaking as a band who have always enjoyed a deeply loyal and enthusiastic fan base of our own, we know just how important the fans really are and what a difference they can make. "We do of course wish the Aberdeen fans every success in their campaign to honour Peter by getting 'DYWM' to No 1 this week and regardless of whether they succeed or not, we hope that both they and everyone involved with the club have a fantastic day at their League Cup parade this coming Sunday. "As we believe the saying goes in Aberdeen, Come On You Reds!" Don't You Want Me was released in November 1981 from the band's album Dare and was that year's Christmas number one.